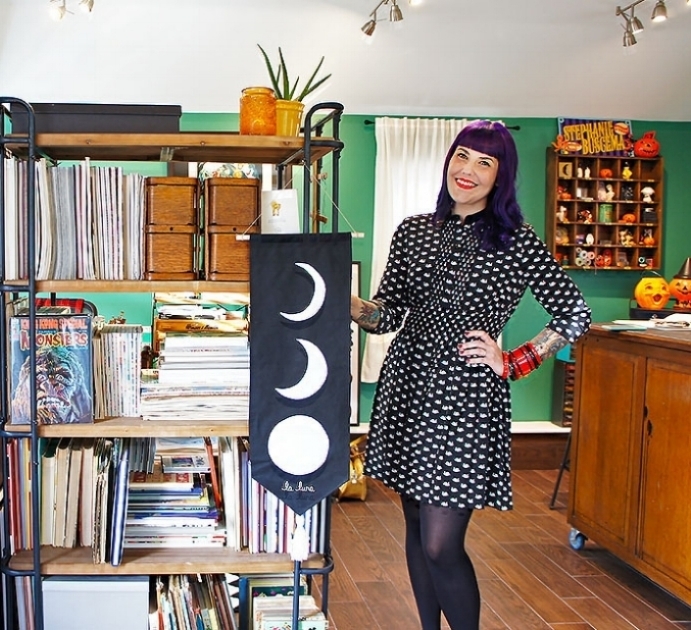 Hi There, thanks for stopping by Kitschy Witch Designs! KWD is an artist owned and operated small business located in New York, specializing in original and playful designs with a nod to the past. Items you’ll find here are inspired by all things whimsical, literature, music, vintage design and my love of collecting+wearing vintage for most of my life! My mission is to create unique collections of items you won’t be able to find anywhere else. Items are made in small limited edition batches, with our custom fabrics and clothing being printed and sewn here in the USA. All art, textiles and designs are created by me in my home studio with real paints, paper and pencils, using traditional image making methods to create just about everything you'll find here. Carefully curated and of course, made with the utmost love and care, KWD is most definitely my passion project. My hopes are you'll find a few things here that will make you smile and bring a little magic into your life! A few years ago, I decided to take my love of jewelry making and create a small business and online shop for fun. I sat down with a rough plan, sketched out my little KW mascot and set up shop. Kitschy Witch Jewelry was born and slowly, it began to grow. As time went on, I started to incorporate my fabric designs into accessories and smalls, collaborations started to happen occasionally, and I had a vision of KW being something much bigger. As a designer, I craved a platform to push my textile designs and artwork further, to explore and share different themes I'm interested in and create a place to just have fun. The pull to invest more time into what I truly love to do was strong and it was time for me to take the leap and make Kitschy Witch Designs become a reality. KWD offers unique designs, accessories, jewelry and clothing pieces exclusive to us. Everything is carefully curated, designed and crafted in very limited edition batches. Designs you’ll find here are inspired by my love of literature, Halloween, vintage collecting and colorful novelty textiles of the past. A little whimsy, a nod to the past, throw some punk rock in there and you've got KWD. Items can be purchased through our online shop or at shows we'll be vending at. Once they're gone, that's it and on to the next design! Be sure to give us a follow on Instagram : @KitschyWitchDesigns for launch dates and sneak peeks of our upcoming collections and collaborations. As an artist and small business, it's so incredibly important to support likeminded people and businesses doing the same. Encouraging each other, celebrating all of our successes and supporting the creative endeavors of others has always been a priority. One of KWD's missions is to occasionally work and collaborate with other independent businesses, makers and designers to create new products to accompany our small collections.